At SIHH 2013 there was a small ‘thinnest’ battle going on but of course, Piaget’s relentless drive to maintain their position at the top of the ‘ultra thin’ watch pecking order is always a given, and at SIHH 2014 it was revealed in the form of the Altiplano 900P, a 145 part, 3.65mm thin watch that was the product of three years of research and announced as the new record-holder for the thinnest mechanical watch. So yes, even at SIHH 2013 Piaget knew what they were going to launch this year, the year of their 140th anniversary. The ‘900P’ part of its name is a descendant/ reference to Calibre 9P, the first ultra-thin hand-wound movement made by Piaget in 1957 which was 2mm thick. Since 1957, the Piaget Manufacture has produced 23 ultra-thin calibres out of the 35 movements developed and produced in-house, of which 12 have set new records for thinness. This is not just a side hobby, it is a major distinguishing feature of the brand, and an achievement they are justly proud of, especially during the past decade when watches seemed to be getting larger and thicker. Piaget made large watches, but didn’t lose sight of their core strength. Each of the Altiplano 900P’s 145 parts has been trimmed down to astonishing levels, including some wheels measuring a mere 0.12 mm thin. However, how they managed to create a watch so thin is mostly down to the merging of the case and movement i.e. the core structure. The back does double duty as the mainplate. This merging of the case and calibre 900P machined directly from the case back meant that the movement construction had to be reversed, with the bridges on the dial side (and visible). To save more space, the entire mechanism and the hand-fitting system are contained within the thickness of the balance-wheel itself, resulting in an off-centred display of the hours and minutes. The mainplate has been satin-brushed and sandblasted, while the wheels are sunburst or circular satin-brushed. The bridges are bevelled, sunburst satin finished and black-coated, for a bit of modernity and contrast. The Altiplano 900P comes in three iterations. In the rose gold version, the watch contains anthracite, and in the high jewellery white gold variant, shown art the start of this post, there are 71 baguette-cut diamonds in the bezel. At 5.65mm, it is the world’s thinnest high jewellery watch. As well as their ingenious method of creating this new record-breaking watch, Piaget have also come up with a patent pending idea – instead of fitting the hands above the bridges, Piaget has placed them underneath, thereby freeing up space between the cannon-pinion and the crystal. When the latter is deformed by the effects of pressure, it presses not on the hands – placed below the bridge level – but instead on the wheel-train bridge, thus avoiding any consequences on the rate of the movement. If you don’t know how thin 3.65mm is, look at this comparison with a 5 CHF coin. Also, Piaget have not compromised on power reserve, with the 900P movement having one of 48 hours. At 38mm these are very nicely sized wearable watches, and because of the thinness, for those who scoff at anything less than 40mm, they sit not only comfortably on the wrist, but seem a bit bigger than they are. 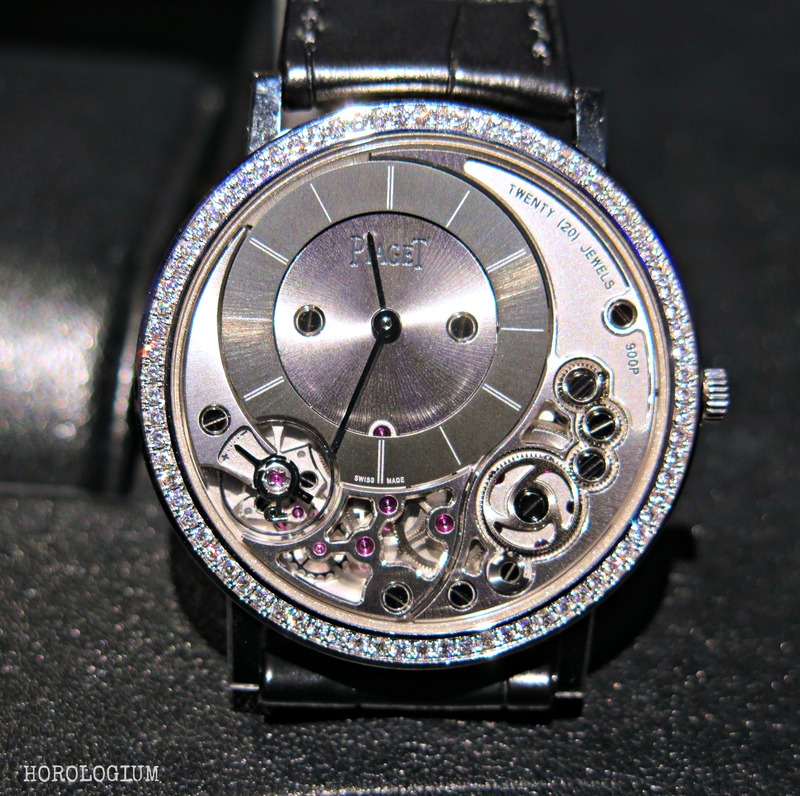 With new records being established in two years by Piaget, what will SIHH 2015 bring? The non-high jewellery Altiplano 900P models are reported to have a cost of around USD20,000 or just over. interesting watch and lovely design. look forward to what next year brings….